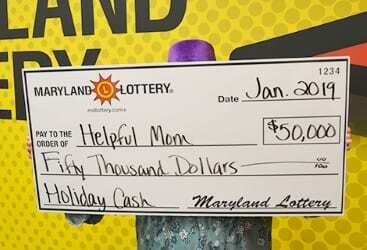 For decades, a Nottingham woman and her family have enjoyed playing Maryland Lottery scratch-offs, especially during the holiday season. This holiday season, however, their elusive dream came true on a $5 Holiday Cash instant ticket. “Helpful Mom” won the game’s top prize of $50,000. The family especially enjoys playing holiday-themed tickets, such as Holiday Cash. The lucky player also picked up a smaller $8 win this holiday season on the $1 Holiday Pets game. The 66-year-old had received those instant tickets as a Christmas gift. 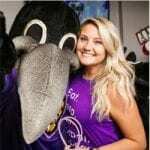 She and her husband plan to use the prize, which they claimed January 3 at Maryland Lottery headquarters in Baltimore, to financially help their two children. “Helpful Mom” and her husband also plan to celebrate their Lottery luck. “We’ll probably have a nice dinner and she will have an adult beverage,” explained “Helpful Mom’s” lucky husband. 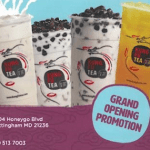 Sharing in the good fortune is the White Marsh Newsstand at 8200 Perry Hall Boulevard in White Marsh Mall. For selling a top-prize winning scratch-off, the store earns a bonus of $500, equal to 1 percent of the prize.